I wanted to share this with you guys. 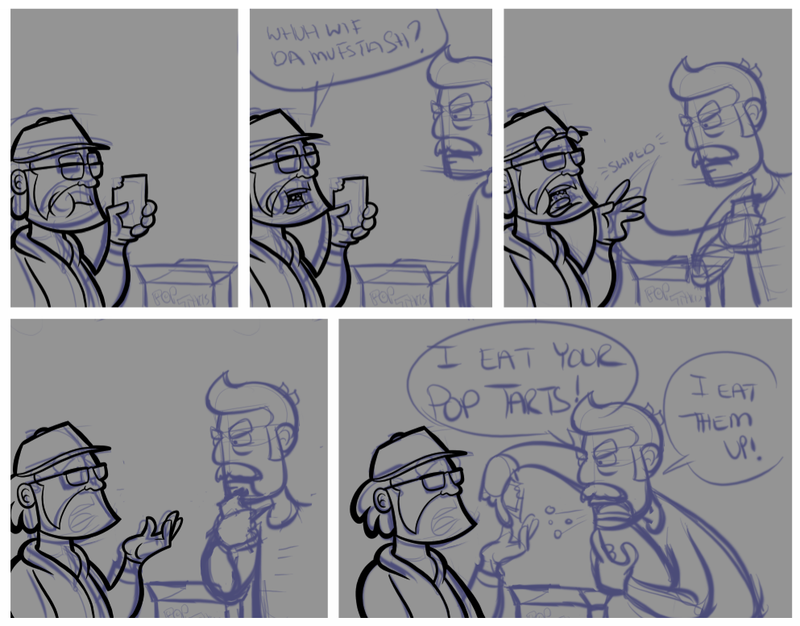 This is a rough sketch for the “There Will Be Blood (poptarts)” comic. 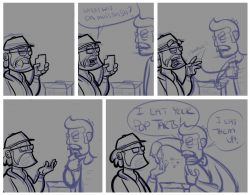 It’s partially inked. I thought you might like to see part of what goes into creating the comics. We managed to record the podcast last night. I’ll have it up in the next day or so. Oh, also a picture Eli took of a Portal Cosplayer at All-Con made it to the front page of Digg. Neato. Posted in Comic Blog and tagged behind the scenes, cosplay, digg, portal. I'm digging your comment. Thanks for sharing the rough sketch. Often, I find the word in progress more interesting than the final result. Dugg the Portal Cosplayer too. Thanks, Caleb. I would like to show a time lapse video of making the comic, but I cant find good screencasting software (that is also free) for OSX. Sorry, should have read, "I digg your comic". The time lapse video would rock. Suggestion: maybe just set up a digital camera on a tripod to do some stop-motion & animate it in a simple app like iMovie (Mac)? Like to see the artist, hand movements, errors etc. Not a bad idea. Im sure my DV-Cam could do something like this. Well what I actually get for using OSX is an onslaught of quality independantly produced software (including fantastic screencasting apps) that are intuitive and functional but require money to pay the developers. Money I would gladly spend if it were in the budget. Looking forward to the new podcast. They help me get through the monotony of writing essays for college in the late night hours. you will hear my interviewing skills for the first time!! 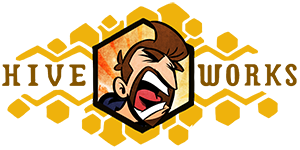 ITS UP! GO GET IT! I cant imagine what sort of super concentration it takes to write a paper while listening to us make balls jokes. Silence bothers me greatly. I could listen to music but I get enough of that in between classes with my MP3 player.